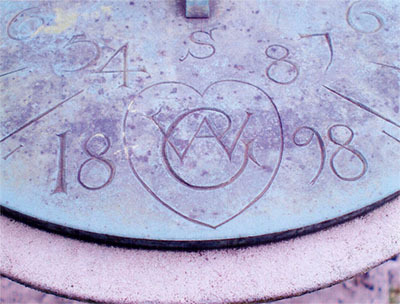 A brass sundial designed by the Edwardian architect Charles Voysey has been stolen from the garden of a Voysey house near Godalming. Possibly between 4pm Friday 22nd May and 7am Saturday 23rd May 2009. The sundial had been in the garden for over a hundred years and admired by thousands of Voysey enthusiasts and historians. It is just the top portion which has been taken, not the stone pillar. 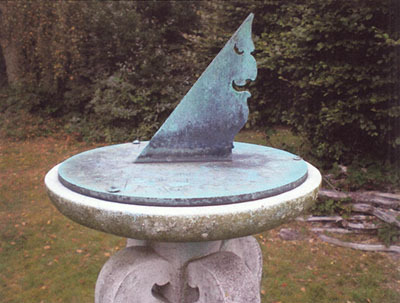 This sundial is easily recognised by the face in profile on the gnomon. If you hear any information about this theft or happen to see the sundial for sale in an antique shop/fair or the Internet, please contact us or Surrey Police on 0845 125 2222. In this part of Surrey there have been several thefts reported recently of statues, York stone paving and other garden items. The content of this site is © copyright 2005-2019 Arts and Crafts Movement in Surrey except where noted. GDPR policy.